in sight. And yet, the signs of fall, though subtle, are there. Kids back in school, days getting shorter, the air acquiring a ‘dry’ and hot smell. Like the season is struggling, and dying soon. I can’t help but think of New England in the fall. This time of year the nights become cooler, the smell of dry crab grass fills the air, and apple picking has started. Everyone gets excited about the changing of the seasons. It’s a wonderful time of year. Naturally, we turn our palettes away from the sweet but finicky summer treats, such as peaches, and toward the heartier and earthier fall ingredients. Like apples. Like pumpkins. Pumpkins are one of my favorites. Roasted and mixed with spices, pumpkins embody everything wonderful about fall in New England. Cinnamon, sugar, allspice, nutmeg, vanilla, cloves… you can almost smell it. Like a Yankee Candle filling and warming the house with bliss. I also think desserts made with pumpkin and spices are destined for success. One of my more successful posts was pumpkin bread pudding http://chefnotebook.blogspot.com/2012/10/pumpkin-bread-pudding-with-white.html which I still love. The smell of the cooking pudding is almost better than the taste. So, now, taking a slight turn, let’s talk about putting those magic pumpkin and spice flavors into an ice cream. 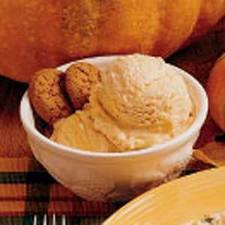 Served over apple pie, pumpkin ice cream could be one of the best things in the world. It takes a little patience, and requires an ice cream machine, but it’s worth it. This is really a basic French-style ice cream recipe (cooked ice cream) with pumpkin, spices and brown sugar instead of white granulated sugar. You will need to ‘temper’ the eggs, which is an easy process of adding hot cream to eggs while whipping, bringing them to an even temperature without cooking the eggs. The process is quite easy, and the results speak for themselves. Side note: this is not my recipe, but adapted from someone else. But I’ve made it, and can’t think of any way to make it better. Best Served with warm apple pie. This entry was tagged Dessert, Fall, Holiday, Pumpkin. Bookmark the permalink.